The Meyer lemon tree in our backyard has been calling out to me for the past few weeks. Today I harvested 10 lemons and doubled-up this recipe (that’s right, i used 18 eggs). I love lemon curd; I really should make it more often because it is amazingly good. I made the curd in a double boiler since I’m paranoid. 1. Adjust an oven rack to the middle position and heat to 350 degrees. Line an 8 inch square baking pan with a foil sling and grease the foil. 2. Crust: Process the flour, confectioners’ sugar, and salt together in a food processor to combine, about 3 pulses. Sprinkle the butter over the top and pulse until the mixture is pale yellow and has the texture of coarse sand, about 8 pulses. Sprinkle the mixture into the prepared pan and press into an even layer with the bottom of a measuring cup. Bake the crust until fragrant and beginning to brown, about 20 minutes. 3. Filling: While the crust bakes, whisk the egg yolks and eggs together in a medium saucepan. 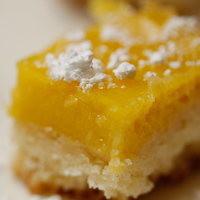 Whisk in the granulated sugar until combined, then whisk in the lemon zest, lemon juice, and salt. Add the butter and cook over medium heat, stirring constantly, until the mixture thickens slightly and registers 170 degrees, about 5 minutes. 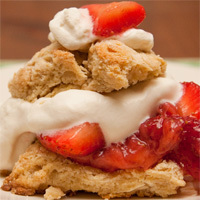 Strain the mixture immediately into a bowl and stir in the cream. 4. Pour the filling over the warm crust. Bake the squares until the filling is shiny and opaque and the center jiggles slightly when shake, 10-15 minutes, rotating the pan halfway through baking. 5. Let the bars cool completely in the pan, set on a wire rack, about 2 hours. Remove the pars from the pan using the foil, cut into square, and dust with confectioners’ sugar before serving. 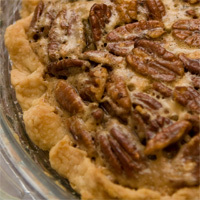 I’m surprised that I’ve never posted a pecan pie recipe. It’s a staple of Liao holiday celebrations. I like this recipe a lot because it has a ton of maple syrup instead of corn syrup. Of course, it doesn’t mean that it’s any less sweet, and it also doesn’t mean that I like pecan pie. 1. 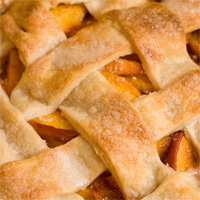 Prep a pie crust like the one for the pumpkin pie. 2. Melt butter in medium heatproof bowl set in skillet of water maintained at just below simmer. Remove bowl from skillet; mix in sugar and salt with wooden spoon until butter is absorbed. Beat in eggs, then maple syrup. Return bowl to hot water; stir until mixture is shiny and warm to the touch, about 130 degrees. Remove from heat; stir in pecans. 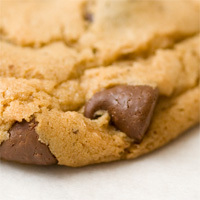 Given their ubiquity, you’d think that chocolate cookies would be easy to bake. Unfortunately I’ve been somewhat terrified of making them due to several bad experiences, most likely resulting from using butter that wasn’t at the right temperature. Some recipes also suggest refrigerating the dough for 36 hours, but who has time for that? I’m a big fan of this recipe, even though I overbaked the cookies by a few minutes the first time I made them. 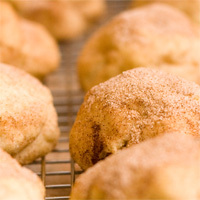 They’re chewy and have a nice toffee flavor thanks to the browned butter. Also, because I was lazy I baked two batches at once, even though the recipe calls for baking one batch at a time. In a Thanksgiving mood, I baked three of these and took them to work. 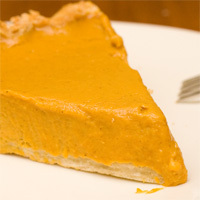 I haven’t eaten all that much pumpkin pie but I thought this was pretty good – almost a pumpkin custard pie. Would probably make them again, especially since I still have one can of pumpkin in my pantry. This is a pretty fool-proof recipe. Only thing I would have done differently is to give the crust a few more minutes to brown. 1. Prep a single pie crust (all-butter, vodka), fluting the edges. 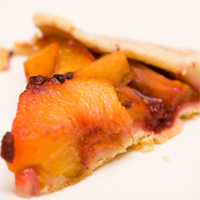 Remove pie pan from refrigerator, line crust with foil, and fill with pie weights or pennies. Bake on rimmed baking sheet 15 minutes. Remove foil and weights, rotate plate, and bake 5 to 10 additional minutes until crust is golden brown and crisp. Remove pie plate and baking sheet from oven. 2. 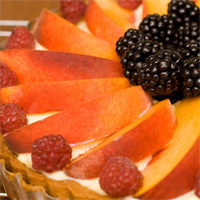 For the Filling: While pie shell is baking, whisk cream, milk, eggs, yolks, and vanilla together in medium bowl. Combine pumpkin puree, yams, sugar, maple syrup, ginger, cinnamon, nutmeg, and salt in large heavy-bottomed saucepan; bring to sputtering simmer over medium heat, 5 to 7 minutes. Continue to simmer pumpkin mixture, stirring constantly and mashing yams against sides of pot, until thick and shiny, 10 to 15 minutes. 3. Remove pan from heat and whisk in cream mixture until fully incorporated. Strain mixture through fine-mesh strainer set over medium bowl, using back of ladle or spatula to press solids through strainer. Rewhisk mixture and transfer to warm prebaked pie shell. Return pie plate with baking sheet to oven and bake pie for 10 minutes. 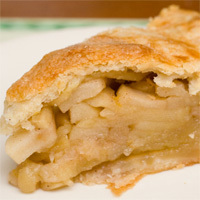 Reduce heat to 300 degrees and continue baking until edges of pie are set (instant-read thermometer inserted in center registers 175 degrees), 20 to 35 minutes longer. Transfer pie to wire rack and cool to room temperature, 2 to 3 hours. Cut into wedges and serve.